Back to basics 😍If you do like modern grunge, then this Spring outfit is what you definitely should give a try during your day offs. We see a grey cardigan teamed with a white tee paired with knee-ripped skinny jeans in grey. Complete this look by adding white sneakers with cute white and pink laces. Casual weekend 😍 Check out this perfect look for casual day offs. We see a navy long sleeve midi dress paired with cool white sneakers. A lovely outfit idea for young businesswomen, who are always on their move. 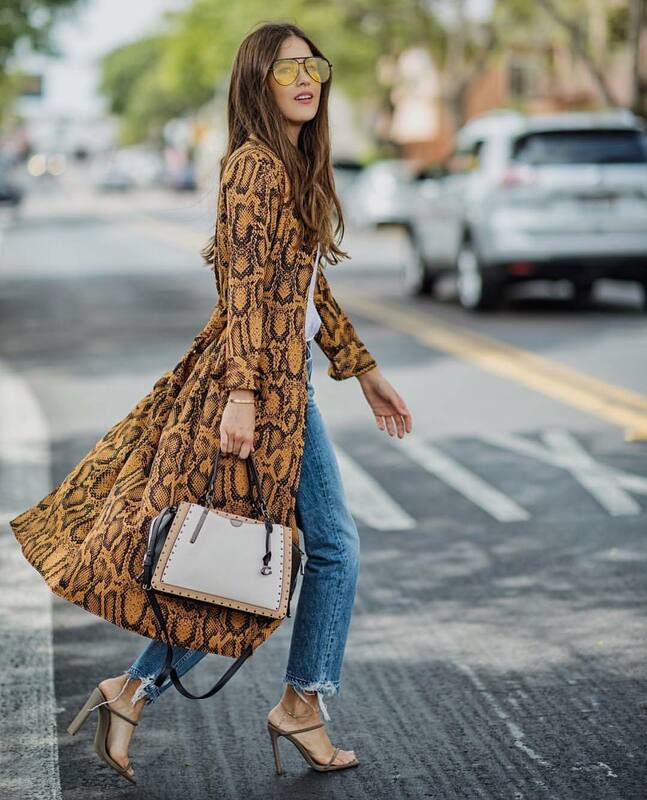 If you do like making a wow statement on the streets, then I highly recommend checking this snakeskin print coat. It’s a fantastic outerwear piece for wearing to parties, work and during your trips. I personally love to see women who keep things simple by wearing such printed outerwear piece with basic wardrobe pieces, like a white tee, regular jeans, and khaki-grey heeled sandals. Coffee time! Get inspired by this fabulous outfit idea for Spring season months. We see a belted grey chunky cardigan teamed with a ripped white denim mini skirt. It’s a perfect combination for casual street walks. Keep it cool, simple and sophisticated. Go for white sneakers and style them with all your favorite basics. It can be a monochrome look consisting of a white crop top and white high-rise ankle pants completed with a black leather jacket and white kicks, either a simple midi sweater dress styled with sneakers, or a skin color bodycon dress with a black leather jacket and white sneakers. Balenciaga fan lover. If you do like casual style with a simple silhouette, then go for this cool oversized sweater dress in grey color. Complete it with stylish fashion-forward sunglasses to underline your uniqueness. Rocking summer style! Check out a lovely Spring season combination for ladies who keep things relaxed and casual. Go for a double denim look in light blue color and complete it with a white crop top and white high-top trainers. Love the relaxed touch of this outfit. Have fun with casual style this Spring season. 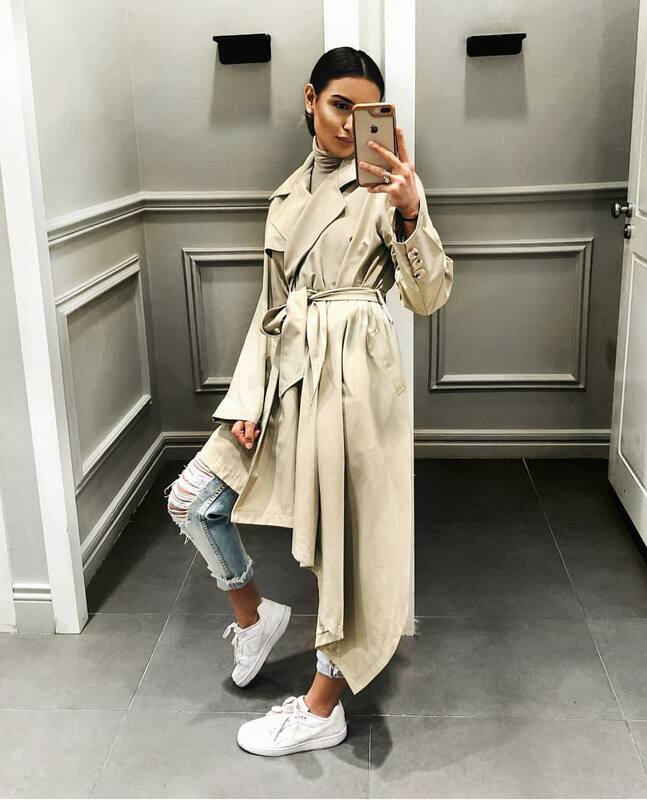 We see a beige trench coat worn over matching color turtleneck. Add ripped blue jeans and white sneakers. Keep things relaxed and creative.